The creation of this space is necessary for two main reasons. First, police violence in the United States has reached epidemic levels. In 2015, more than 1100 people died at the hands of or in the custody of American police officers. A disproportionate number of those killed were black, poor, transgender, mentally ill, or a combination of all four. Second, police reports of many of these deaths--including Mya Hall, Natasha McKenna, Walter Scott, Sandra Bland, and Samuel DuBose--narrate a sequence of events that video or forensic evidence later disproved or challenged. In many of these and other cases, the initial police reports allowed officers to completely or nearly escape accountability. This pattern extends to Cleveland with the deaths of Malissa Williams, Timothy Russell, Tanisha Anderson, Tamir Rice, Brandon Jones, and others. 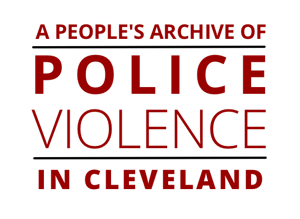 It is within this context that A People’s Archive of Police Violence in Cleveland is established. May this online space for healing, accountability, and justice continue to exist so long as the national crisis of police violence persists.